Bob King, left, head of the UAW's Ford Department, is in line to succeed UAW President Ron Gettelfinger in June. The incoming boss at one of Detroit's largest automotive players is an often emotional leader with a political view of the business world, say senior auto executives who have dealt with him. 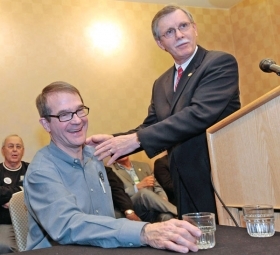 Bob King is in line to be elected the next president of the UAW in June. King, 63, a lawyer and UAW vice president in charge of the union's Ford Department, was nominated for president by a steering committee of the union's administrative caucus. UAW President Ron Gettelfinger is 65 and, under UAW policy, could not seek re-election. King takes over a shrinking union. In 2007, the last year for which data are available, the UAW had about 465,000 members, the fewest since 1941 and down from a peak of nearly 1.5 million in 1979. The union has shrunk further since then. King joined UAW Local 600 in 1970 when he was hired at Ford Motor Co.'s Detroit Parts Depot. Starting in 1998, he headed the union's National Organizing Department, where he boosted membership at parts suppliers but failed to organize Japanese auto plants in the United States. UAW members soundly rejected a recent tentative agreement that he had negotiated with Ford. The automaker said it needed the concessions to bring its labor costs in line with those at GM and Chrysler, which shed costs through their bankruptcies. But critics said the agreement would have given away too much and particularly objected to a no-strike clause.